The IoT will enable – and in some cases force – new business models for companies that use IoT systems in their operations, while creating new lines of business for technology companies. As a result, Europe is also facing a digitalization of business processes. While consumer products increasingly use cloud services and wireless connections, industry applications are hindered by the fear of malign consequences. Physical parts of the IoT such as sensors/actuators and wired communication are generally well developed and established. However, wireless solutions – although having major benefits for usage, such as increased flexibility, mobile applications, weight reduction, adaptability for changes etc. – are not yet fully accepted. They are still regarded untrustworthy, in particular when it comes to application areas where security and privacy are required. 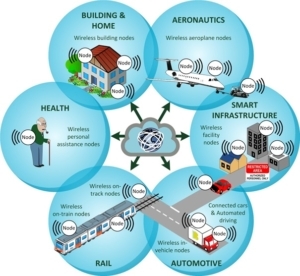 SCOTT – Secure Connected Trustable Things will provide comprehensive cost-efficient solutions of wireless, end-to-end secure, trustworthy connectivity and interoperability to bridge the last mile to market implementation. SCOTT will not deal with just ‚things that are connected‘, but ‚trustable things that are connected‘, i.e. things interconnected by dependable wireless technology and valuing the end-users‘ privacy rules. SCOTT bundles the European key players from several industrial domains including building and home / smart infrastructure, automotive, aeronautics, rail, and health to make full potential of cross-domain synergies and to strengthen Europe’s position in the emerging technology field of secure IoT. aiming at strengthening European leadership and market opportunities.